The Deserted Village/Feltville went through many incarnations since its founding by David Felt in the mid-1800s. Anyone who once lived in the village, or visited, is invited to participate in The Deserted Village’s Oral History Project. Any old photographs, letters or any other memorabilia, would be welcome additions to the museum collection. For more information, please either email dv@ucnj.org or call Daniel Bernier, who oversees the Village, at 908-789-3682. In this section of the Deserted Village website, we will also be compiling some of the stories about former residents. Patti Slobogin drove slowly so that her mother could take in all the changes to “the neighborhood” she hadn’t seen in more than 75 years. Some things had changed–others hadn’t. But to just be there again—to see the porches where she would sleep on warm summer nights–was enough for 88-year-old Becky Slobogin, who grew up in The Deserted Village, in the heart of Union County’s 2,000-acre Watchung Reservation. Slobogin is the oldest person known to have lived in the small enclave, once known as Feltville, a small mill community founded by David Felt in 1845. So when County parks officials learned that she wanted to visit, they were thrilled. 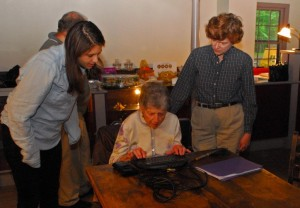 “It was wonderful to hear Mrs. Slobogin’s recollections of her childhood in the Deserted Village,” said Union County Freeholder Bette Jane Kowalski, who met Slobogin and her family at the Deserted Village’s restored church/general store. “She came a long way — in distance and in time — to share her memories with us,” Kowalski said, noting that Slobogin, her daughter, and granddaughter, Cassie Spodak, drove all the way from Ossining, N.Y.
“She is a living link to a past that few people remember, and we are very grateful to her for taking the trouble to come and visit us,” Kowalski said. 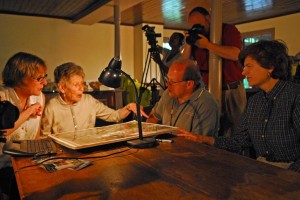 Slobogin, who was five years-old when her family moved to The Deserted Village in 1928, was interviewed by Daniel Bernier, who oversees historic settlement as part of his responsibilities with the Union County Parks department. The interview was videotaped and will become part of the growing online archive about The Deserted Village on the County’s website, www.ucnj.org/desertedvillage. After the interview, Bernier led a tour of the village. While Slobogin’s home was destroyed in a fire in the 1950’s, just to finally return and see her childhood neighborhood brought her close to tears. While she would later live all over the world because her husband was with the CIA, Slobogin’s greatest wish in recent years, her daughter said, was to see the Deserted Village again. This summer, visitors to The Deserted Village will have a chance to see the inside of some of the restored buildings, as well as enjoy a guided tour of the village. While the grounds are open every day, dawn to dusk, funding from a state grant has enabled the opening of the Church/General Store and Masker’s Barn from noon to 5:00 p.m. on Saturdays and Sundays through Aug. 26. Admission is free, as are the 45-minute guided tours that are available at 2:30 p.m. each day. No reservations are required. Funding for the summer openings was provided, in part, by the New Jersey Historical Commission, through a grant administered by the Union County Office of Cultural & Heritage Affairs. In 1845, David Felt built a mill along the Blue Brook and an entire town on the bluff above the mill to house the 175 people who would work there. The area became known as Feltville and was a thriving mill town from 1845 to 1860. After being sold by Felt, the village wasted away and became deserted, but was reborn in 1882 as Glenside Park, a summer resort. This business closed in 1916 and the Village was again briefly deserted until being purchased by the Union County Park Commission during the 1920’s. As the Great Depression set in, and more and more people were losing their jobs, the Deserted Village became a haven for those searching for cheaper places to live, said Slobogin, recalling how her father was laid off from his job in Elizabeth. Her father, George Pfouts, also published the community newspaper, she said, recalling how everyone couldn’t wait to read the next issue. Unfortunately, copies of the newsletter, which would have been a goldmine for cultural anthropologists, were not saved. Slobogin has fond memories of playing with the family dog, Patsy, along with hikes to The Gorge and Lake Surprise. And while she doesn’t recall many names, the Dutch family who lived in the old school house are still a vivid memory. 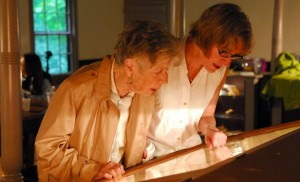 Becky Slobogin,88, points to some of places on a map she remembered from her childhood spent in The Deserted Village, in Union County’s Watchung Reservation. Slobogin recently visited the village with her daughter Patti, left, for an oral history interview with Daniel Bernier, who oversees the village, while Union County Freeholder Bette Jane Kowalski welcomed Slobogin back to her childhood home. Becky Slobogin, left, and her daughter, Patti, look at some of the display cases at the church/general store in The Deserted Village in the Watchung Reservation. The building now serves as a museum for the village, which went through several incarnations from mill town to resort, since its founding in 1845.